This is a list of my Favorite Instant Pot Accessories. I have collected quite a few over the years, and I am often asked what my favorite pressure cooker accessories are. So here is the list, which I update fairly often. Last updated 12/03/18. I should also mention that not all of these are made by the Instant Pot® company, and most work well in other brands of electric pressure cookers. Check the dimensions of your pot to make sure the accessory you want will fit! We are a participant in the Amazon Services LLC Associates Program, an affiliate advertising program designed to provide a means for us to earn fees by linking to Amazon.com and affiliated sites. The links on this page are affiliate links. A divided steamer basket is handy for making 3 different veggies at one time. This set has the removable divider and a trivet to set it on. Good quality. These egg steamer racks are neat because they are dual purpose. You can use them for eggs, or for any other food that will need a rack in the pressure cooker. And they stack! They come in a set of 2. If you ever want to make a beer can chicken in your 6 qt pressure cooker, this is the rack/holder you will need. You can also use it on the grill! I really like the OXO brand. This steamer rack is better than the others in this style because it has feet that stabilize it, and the long handle lets you get it out of the pot much easier. This steamer fits in the 6 qt Instant Pot. The handles make it easy to put in and take out of the pot! I like this silicone steamer basket because it has more surface area and you can fit more in it. For the 6 qt pot, and especially good in the 8 qt pot. I have two of these. I use them a lot for diced potatoes for potato salad, eggs, and so on. You have to snap off the handles to make it fit, but it’s not too hard to do. Totally worth it for the great price! This is a popular stainless mesh steamer basket for the 5 and 6 quart pots. They sell out often. Here’s an option for those with the 8 Quart. It won’t fit in the smaller pots. I use this in my Instant Pot when I want to cook something underneath a pan or steamer. A pan can sit on this as the taller legs makes it perfect for pot-in-pot pressure cooking! This is another tall trivet / stand to use when you cook something on the bottom, and another food on the top. A good example is potatoes on the bottom, in broth, and a meatloaf on the trivet on foil, or in a pan that fits. This is another useful silicone steamer rack. I really like the long handles. 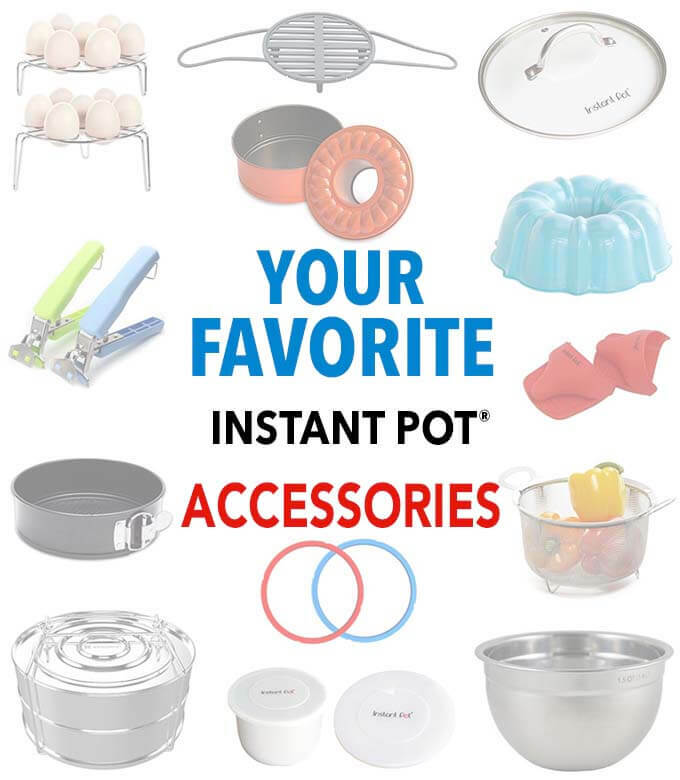 Let me know if you have any favorite Instant Pot Accessories that I can add to this list! 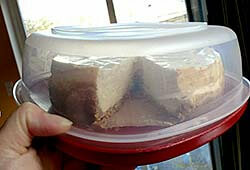 This is also referred to as a “Push Pan” because you push the bottom up to get the cheesecake out. I use this style pan for my Instant Pot cheesecakes, and it’s perfect! They have sizes to Fit in the 3, 5, 6, and 8 Quart Instant Pot. Some folks like to use the springform pans for their cheesecakes. Stackable Stainless Steamer Insert Pans allow you to cook more than one type of food in one pot! I use them together, stacked, to make more than one thing at a time. I also use them separately for making rice, fish, cornbread, scalloped potatoes, stuffing, and so much more! One of my favorite Instant Pot accessories! Available for the 3, 6 and 8 Quart. Another option for the stackable stainless pans, this one has a second lid with holes in it. This one is designed for the 6, or 8 quart pots. Another option for the stackable stainless pans, this one has a second lid with holes in it. This one is designed for the 8 quart pot. Similar to the ekovana, but the bottom pot is larger. I like that for making a main dish in the large one, and a side in the smaller one. I don’t own it, but it has pretty good reviews. This Nordic Ware 6 cup Bundt Pan is great for so many things. Yes, you can make a cake in your Instant Pot, but you can also cook stuffing, meatloaf, and more! I use this 1.5 quart stainless bowl for heating frozen leftovers in the IP, and for Pot-in-Pot cooking. Very good quality! I like to use the springform pan for lasagna, taco pie, cheesecake, and other misc. creations. This pan from Debbiedoo’s does Double Duty as a Springform or a Bundt pan! Great for making cakes and many other culinary creations! And it’s pretty! I have both the blue and the orange. Another pan from Debbiedoo’s, this is a 3-cup bundt style pan. It will hold 8 eggs or 1/2 of a standard cake mix. Fits in the 3 qt pot and up! These little silicone cupcake molds make perfect egg poaching or individual egg bake “pans.” Also good for tiny individual cheesecakes! This tray is a baby food freezer storage tray! It is silicone, so great to cook in. Fits in the 6 and 8 quarts. Make the famous “Egg Bites” or little cheesecake bites (I know, a lot revolves around cheesecakes, as it should!). MADE-IN-USA – Popfex Silicone Egg Bites Mold for Instant Pot Accessories (NOTE:) There are different brands of these, and they run out fast, so just search Amazon for “silicone baby food storage” and you will find them). If you have the 3 quart Mini, these will fit! I use them for Egg Bites. Use this square silicone ice cube tray to cook in! Make cornbread squares, brownies, or whatever you want! Cleaning under the rim of the Instant Pot lid area can be a pain. I used to try to shove a paper towel down in there and wipe it all the way around. Then about a year ago I saw someone use one of these foam brushes! Mind=Blown! They work perfectly! Keep the dust off, or just enjoy these well made Pressure Cooker Covers from Debbiedoo’s, with a pocket! For the 3, 6 & 8 Quart models. They come in different colors to coordinate with what you have going on in your kitchen! I am very happy with these measuring spoons! They FIT IN MY SPICE JARS! And, they are high quality stainless. I was pleasantly surprised at how heavy duty they are. The set even has a 3/4 teaspoon size! They are flat on the bottom (the rectangle shape, not sure about the oval), so if I need to set one on the counter, the contents won’t spill out. Did I mention they have a lifetime warranty?! I was not paid or anything to say this, I really love these! When making a cheesecake crust you can use your fingers, the bottom of a small glass, or one of these! It actually works really well, which is good as it’s designed as a pastry tamper! I found the perfect inexpensive cheesecake storage! I had one in my drawer, and one day I just decided turn it upside down and try it. It fit my 7 inch cheesecake perfectly! You get a set of 2, so this is a great deal! Grifiti Bands can be used as a sling to get your pan in and out of the pressure cooker inner liner when you are doing Pot-in-Pot cooking, like a cheesecake. Handy! This is the best deal, and has sizes for other uses, too. It seems that the 6″ and 9″ “X shaped” bands are the most popular with Instant Pot users. I use parchment rounds when I make my cheesecakes. They are precut to the size I need, which is either 7″ or 6″ depending on the pan I’m using. Not a bad price, either! They also come in Natural, which I haven’t used, but looks like unbleached paper. Sometimes you have to remove the hot inner liner from the pressure cooker. The pot holders that are cloth can get wet and absorb the hot liquid. These are great! I use them all the time. Topoko Pan Grippers work really well to get hot pans out of the Instant Pot. I use them for Pot-in-Pot cooking to get the pan out, if I’m not using a sling or long handled trivet. Making yogurt in the Instant Pot is very popular, and many people like to use this to strain out the whey to make thick Greek style yogurt. While I don’t think it’s a good idea to put your Instant Pot on the stove, sometimes folks have nowhere else to use it. What often happens is that the IP is sitting directly on the burner and the switch gets bumped. Then the bottom of your pressure cooker gets melted and it’s just not good. Or safe. If you must use your IP on the stove, try putting it on something like this cutting board that has feet that raise it above the burner. At least if the knob gets bumped, this will buy you some time before the IP gets ruined. I use a food scale several times a week. Granted, I cook a lot, but this scale is so nice to have. If you follow my recipes, you will know that I give some ingredients in weight. I weigh all kinds of stuff with it! If you cook meat or make yogurt using the boil method, an instant read thermometer is important. I use mine for roasts, meatloaf, chicken, yogurt, etc. Every cook needs one of these. I make a lot of cream or blended soups in my Instant Pot. I could not do it without my immersion blender! Who wants to transfer hot soup to a blender?! Another of my favorite Instant Pot accessories (not really an IP accessory, but so very useful!). This is a perfect spatula for the Instant Pot! It is flexible, but not too much. It is made for high heat, so you can stir with it. I really like this one! I use my glass lids to cover the pot when I’m heating water or stock before pressure cooking, and when I make yogurt, as well as keeping food warm and with the slow cooker function. A must have, in my opinion! One of my favorite Instant Pot accessories! If you find that you want to put something in the fridge without removing it from the stainless inner liner, or transport a pot of food, the silicone covers fit well, and are very useful! 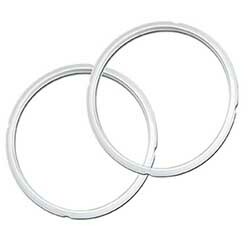 Extra sealing rings are a must, and one of my favorite Instant Pot accessories! They wear out eventually, so you’ll want to have an extra on hand. Not only that, silicone picks up odors of the food you have cooked. The plight of the IP cook is the STINKY RING! There is no easy answer, I wash and soak, and put out in the sun, and the smell never goes completely away. I don’t want that odor to get into sweet or neutral foods I cook, such as yogurt and rice. I once made applesauce that tasted like a roast! So now I have a ring for neutral and sweet foods, and one for savory/spicy foods. 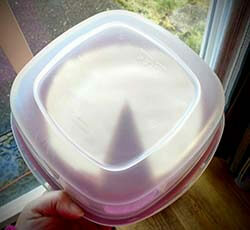 It also helps if you store your lid upside down on your pot so the ring is exposed to the air. That helps a lot! NOTE: If you have an Instant Pot® Brand pressure cooker, it is important to only use the silicone sealing rings that are made by Instant Pot. For your warranty to stay valid, and for safety. I love to make my mac & cheese, rice, and oatmeal in this pot because clean up is so easy! One of my favorite Instant Pot accessories! Busted! I already have a few of these. Now, if I could only find some for my 3qt. I heard that the 3 quart accessories are on their way! Can’t wait to see what they come up with! I hope so, I have a 3 quart and haven’t found any accessories. The glass lid was the only one and it sold out. Hi Catherine, I plan on updating this list as I find things that work. I will be adding the 3 quart Mini accessories as I find them, too. Check back in a few days as rumor has it there are some 3 quart goodies on their way! Thank you for posting all of these wonderful accessories for the IP. I just recently got the IP and I love it but I was having trouble finding seals (I always like to have the spares here and ready). Also saw the nice mesh basker, the stacking pots, and needed new measuring spoons and really liked the ones you featured. Thank you for your recipes and these accessories post. I am looking forward to enjoying my IP even more. You’re welcome, Kathleen. Thank you for visiting! Thank you for such a great list! I was curious about making cheesecake bites in the silicone baby food storage tray. It sounds delicious! Do you have a recipe for these? Thanks you so much! You’re welcome! You can use my cheesecake recipe and cook about 1/3 of the time. New York Cheesecake. Hi. Thanks for showing all this good info. I got my first instant pot and got the 8 quart duo plus. Then everywhere I looked people were recommended getting the Duo Plus for the 6 quart model and getting the plain Duo for the 8 quart. I’m confused about that. Is it a price issue? I haven’t used it yet and feel like sending it back and getting just the Duo 8 quart not the Duo plus 8 quart. Can you please help? Thanks so much. Deborah. The DUO Plus 8 quart is a great model. I would stick with it and just start using it. I own the Regular DUO 8 quart, and it is also fine. I think you will enjoy the DUO PLUS. If it is about the money, then see if the DUO is cheaper and get that one instead. Do u know if any of the accessories can be purchased in a store. Yes, there are many stores that carry their own brand of pans and such, you will want to measure them while you are at the store so you know they will fit. You can cut many of the 6 qt recipes in half and that will usually make between 2 and 4 servings, depending on what it is. I’m new to the instant pot. I got a 3 at mini duo for christmas and it all seems so confusing to me. What size accessories fit this little one and where are all the good recipes at? Hi, there are more accessories for the 3 qt now than what was available last year. Many of the manufacturers make a 3 qt option. You would need to view their product listing to see if they do. It’s hard to keep up as new accessories are being introduced all the time. Look for 6″ diameter, and 2″ to 3″ height for cheesecake pans, if you want one of those. I have some 3 qt recipes here, and most of my recipes can be halved to fit the 3 qt. Most of the Instant Pot recipes out there are created for the 6 qt size, as that was the first size available, and the most popular.